BOOCH Kombucha is a locally made in Ontario. 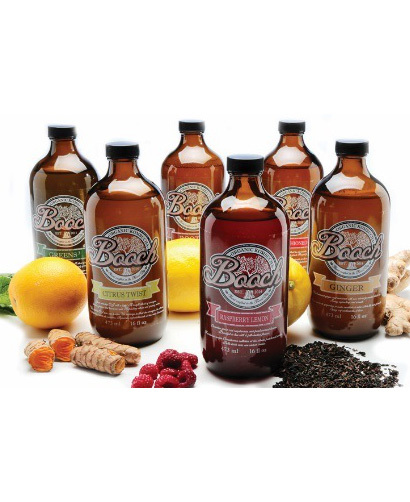 From brewing to bottling, handcrafting every part of the process makes Booch stand out from the rest. Tastes like a picnic on a sunny summer’s day. Organic raspberries mixed with fresh pressed organic lemons. A long-lasting finish that’s beautiful in hue & robust in flavour. Like ginger ale, but much healthier. Fresh pressed organic ginger root combined with our fair-trade organic black tea. Spicy & refreshing, with a smooth, long finish. For the lovers of chlorophyll & everything green. Organic kombucha married with nettle, spirulina & peppermint oil. Green, minty, diverse & potent. Give your morning orange juice an anti-inflammatory twist. A bright blend of organic lemons, oranges, ginger & turmeric root. Delicious & refreshing with citrus, grassy notes. Kombucha the way it has been made for centuries… with our secret touch, of course. Organic fair-trade black tea, raw cane sugar & love. Soft apple notes with a fruity finish. The perfect afternoon pick- me-up. A warm blend of wild-crafted chai spices including cinnamon, anise, cardamom & clove with sacred chaga mushroom.